In this edition of Pala Mineralis we take this opportunity to offer our deepest thanks to you for your patronage. Thank you also to all who have contributed content to our newsletters. We wish everyone happy holidays. After the holidays, we’re looking forward to the world’s greatest gem and mineral show in February. One-stop general information about individual shows can be obtained from the Tucson EZ-Guide. Pala joins nearly 100 exhibitors for this annual extravaganza. More than forty free seminars are offered by notables in the world of gemstones and pearls. Pala International’s Bill Larson will speak on the topic “Back to Burma” on Wednesday, February 6, from 1:00 to 2:00 p.m. in the Mohave Room. Pala International and two dozen other world-class mineral dealers shack up at a Sonoran Desert resort. See Pala International’s page on the Westward Look Show site. See also this dealer map. 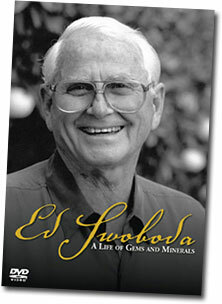 Ed Swoboda was this year’s Sunday evening presenter and the event was captured by BlueCap Productions. This month we feature a pair from Pakistan and Afghanistan. From the western front of the Himalaya Mountains we find a couple of exquisite crystals still carrying a chunk from the host rock. 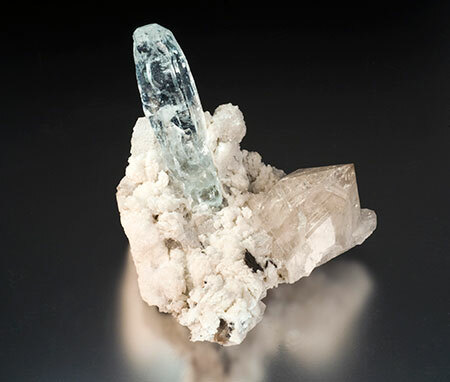 This aquamarine is like a prismatic glacier poised in a bed of cleavelandite and accompanied by a quartz point. There are a of couple traces of pink apatite and possibly tantalite on the specimen as well. 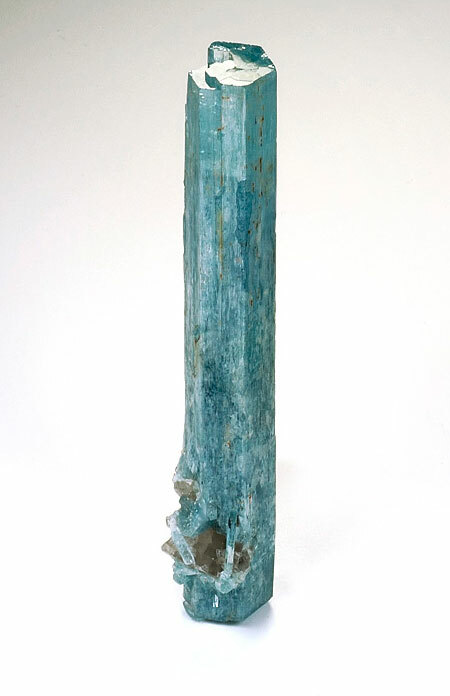 This aquamarine exsolved from its original form to its current etched shape, leaving a pastel-blue, gemmy, ice-like sculpture. This oddity comes to us from Shigar Valley, Pakistan. Just across the border, in Afghanistan, we find this classic pink prismatic kunzite crystal still wrapped in the pegmatite host. It’s a classic lilac kunzite blade over 7 cm and very gemmy. 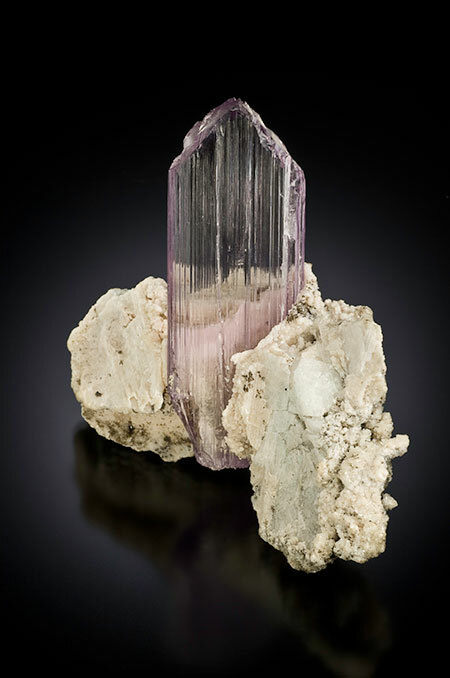 It is quite a rare find to see kunzite still attached to the matrix; almost all of the specimens seem to be loose single crystals. 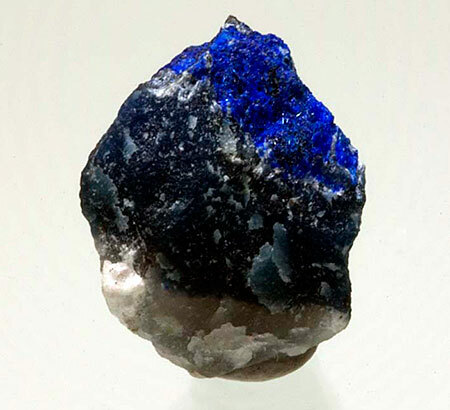 A choice specimen for gem crystal collectors, from the Pech, Konar Province, Afghanistan. This year is the 40th anniversary of what one museum curator called “the find of the century.” In early 1972, history was made in northern San Diego County with a stunning find of “blue-cap” tourmaline specimens that would go by the now-familiar names of “Candelabra,” “The Rabbit’s Ears” and more. 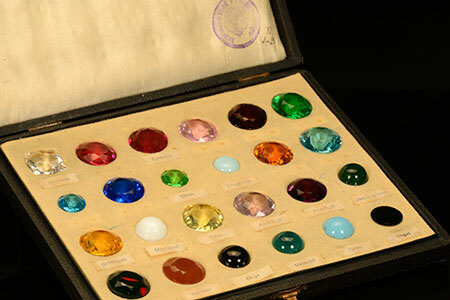 That year, following world-class specimen after museum-quality specimen being eased from the clay of the Tourmaline Queen Mine, Pala International’s Bill Larson penned a piece on the discovery for Lapidary Journal. 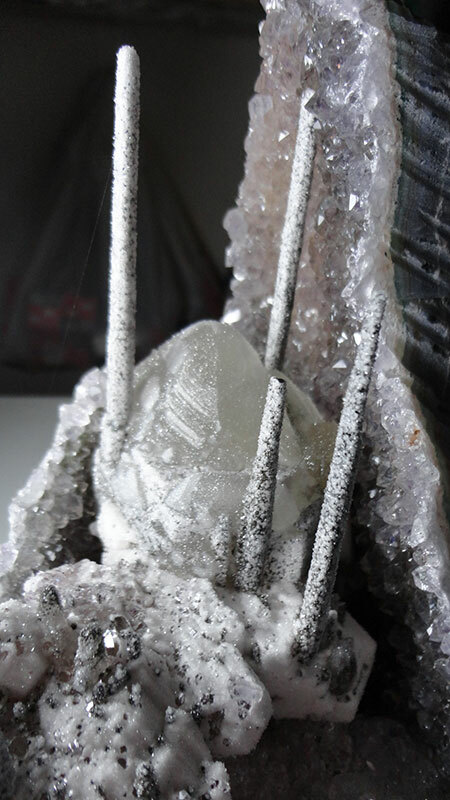 The article has been reprinted in the current edition of Minerals: The Collector’s Newspaper, published by Poland’s Geological Society “Spirifer.” The article is richly illustrated with on-site and studio photographs, some of which have never been published. 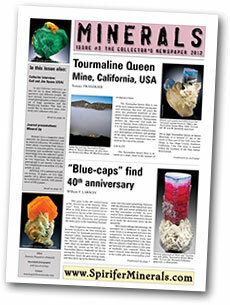 Accompanying Bill’s article is a profile of the Tourmaline Queen by Spirifer’s Tomasz Praszkier. The text and accompanying photographs take you through the years at the mine, which turns 110 in March. 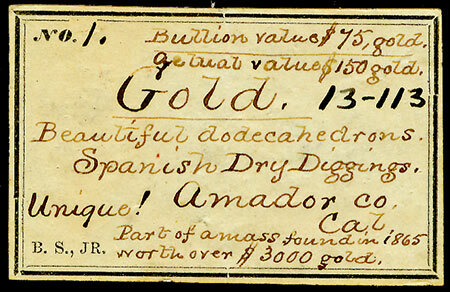 While the mine is no longer active, it has produced lifetimes of treasures. 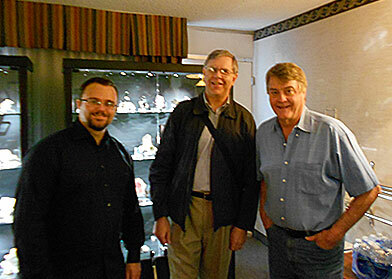 In our sibling e-newsletter last month we featured a collection of hand-cut glass crystal models, pictureed at right, acquired by Pala International’s Bill Larson this year at the Denver show. The set of models now has a place in the Virtual Museum of the History of Mineralogy. Bill brought out three more collections, which we share here. 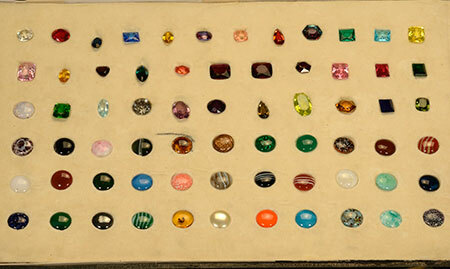 We begin with a set of 72 glass models of faceted and cabochon gemstones from the early 20th century. 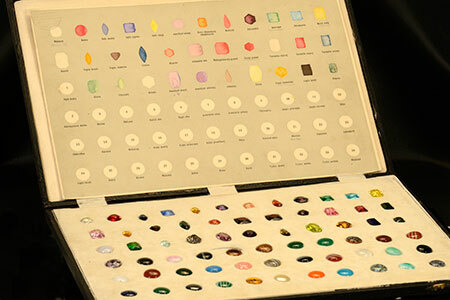 The second collection, also from the early 20th century, contains 24 models of faceted and cabochon gemstones. 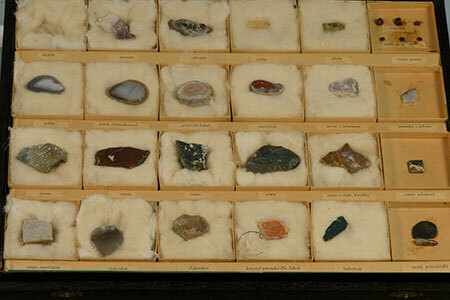 Lastly, a set of 24 gemstone specimens from Bohemia. In 1907, George Gibbs, above, published his novel The Medusa Emerald. His illustrations appeared in many magazines as well as his own books. 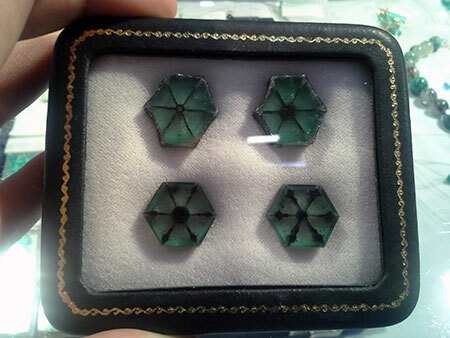 Today we have the opportunity to see the real Medusa Emerald on display at London’s Natural History Museum. 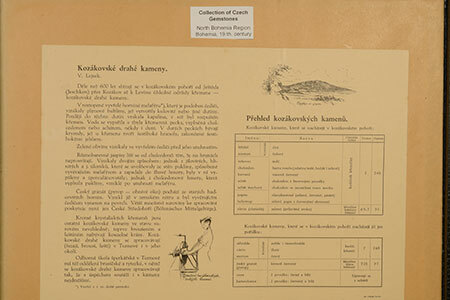 This unique specimen is being presented in the museum’s Green Zone exhibition area known as The Vault. 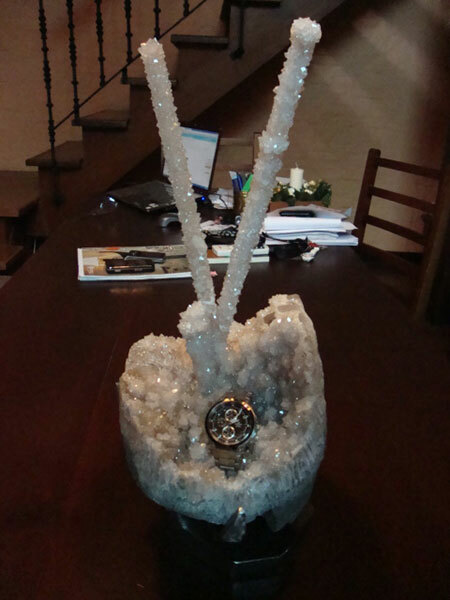 The specimen was mined in Zambia in 2008 and sent to The Collector’s Edge in Colorado to be cleaned of its quartz matrix. When we visited Elise Skalwold at Cornell in October, she told us a story (recounted below) that will appeal to anyone who ever has visited the archives of higher learning and other institutions. Yes, typewritten correspondence is great for the information it contains, even an email printout, but there’s nothing like handwriting to connect us with the character of our subjects. I like old documents, especially handwriting, as you know. 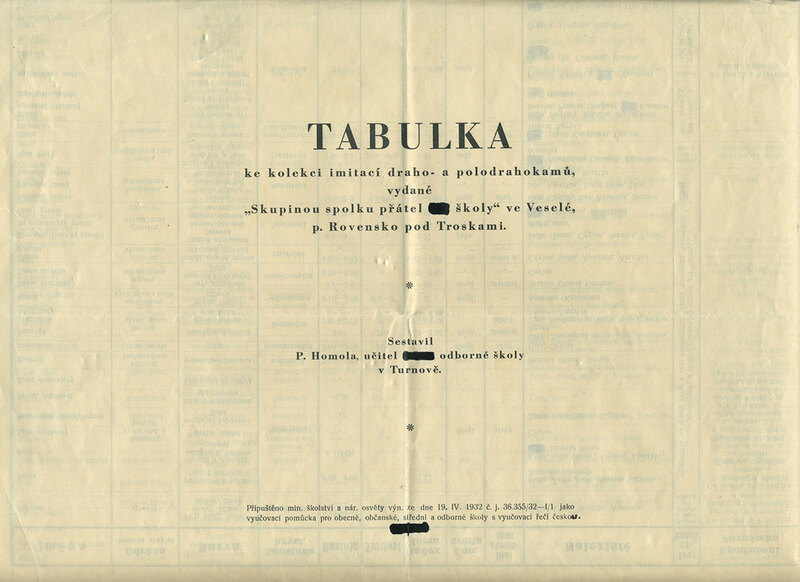 I think without that first label I might not have pursued what has become a big project for me: often when an institution accepts a collection, old labels are discarded (or maybe filed and then someone in the future throws the file out...in this case sometime in 125 years). Everyone said I would never find the original Silliman labels which accompanied a diverse mineral collection Cornell acquired in the 1870s from Silliman who was then at Yale. I took the diamond photo in 2009, sporadically searched for records, labels, any documentation; this past summer I found a stash of dozens of labels hidden under a shelf. In the meantime, I’ve been researching Benjamin Silliman Jr. and have uncovered a “colorful” person. In October, in our sibling publication, Elise reviewed a monograph on amethyst, isssued by Lithographie. It is these crystals, found in pockets and veins as Waring describes, that continue to thrill miners, dealers, and collectors 107 years after Waring’s study was published in The American Geologist. Below are four recent items from our sibling publication, Palagems Reflective Index, will be of interest to mineralophiles. Pala International loves to have had the opportunity over the last two years to have floor space at the Munich Show. This year, Pala also contributed to the show’s themed exhibition, “African Secrets.” Several Pala people were caught in the camera lens of fellow Southern Californians Eloïse Gaillou and Alyssa Morgan, members of the Mineral Sciences staff of the Natural History Museum of Los Angeles County, who attended the show. Behind-the-scenes shots and more are included in Gaillou’s Minblog post. The photos below are included, with ten more, in “Munich 2012” on Palagems.com. Will Larson was quoted in Süddeutsche Zeitung, Germany’s most popular national daily newspaper. We provide a rough translation of a excerpt below. The darling of German windowsills, “The Snail” is an approximately fist-sized rhodochrosite, shaped like a black worm with a red “house.” “I like the shape,” says Will Larson, a young man dressed in a purple shirt, and as he says it, he shows almost childlike enthusiasm. Will’s father [Bill] said the specimen was discovered* from the South Africa N’Chwaning mine during manganese removal. 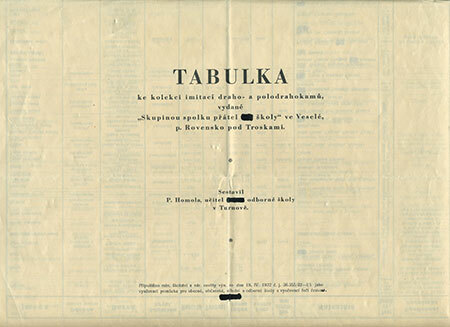 The Austrian dealer and collector Rudolf Watzl estimates the value of the specimen at about ten million euros. [Implying that it is invaluable,] he says, “This is your possession, but not with money to offset,” looking longingly at the glittering red. 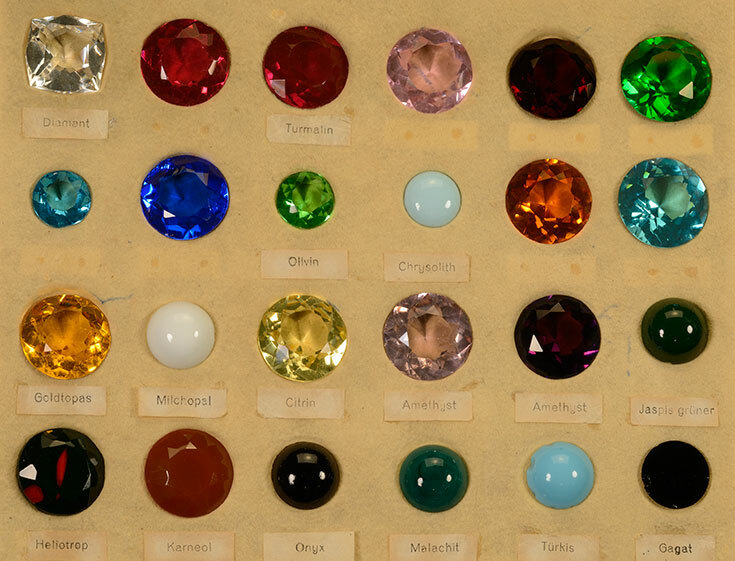 These minerals show that, in the Larson home, value is put into curious shapes, such as Will’s “Mickey Mouse” and “deadmau5,” precious stones in orange [olmiite] and green [prehnite], which strikingly resemble their namesakes. “The value of the pieces is not calculated in price,” says Will Larson, who works day-in-day-out with mineral specimens: “It is the love of their beauty.” And that is there to be seen—if the grandeur of the stones is reflected in the eyes of the beholder. *The German-language version of the article states, inaccurately, that “The Snail” had been “smuggled” (geschmuggelt) from the mine. 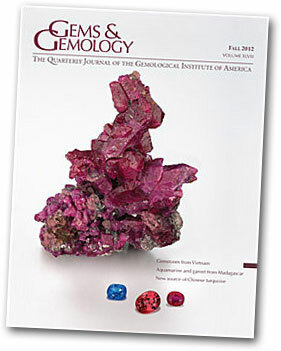 Pala International is cover star of the current Gems & Gemology journal, issued last month by GIA. 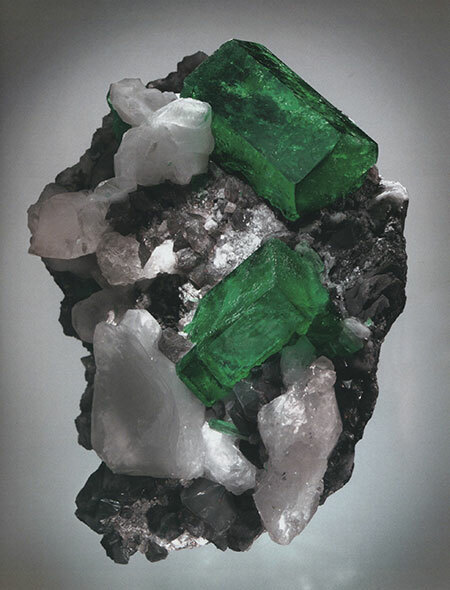 The specimen and stones, photographed by Robert Weldon, herald the featured article, “Gemstones from Vietnam: An Update,” by Dr. Le Thi-Thu Huong and a team of coauthors. 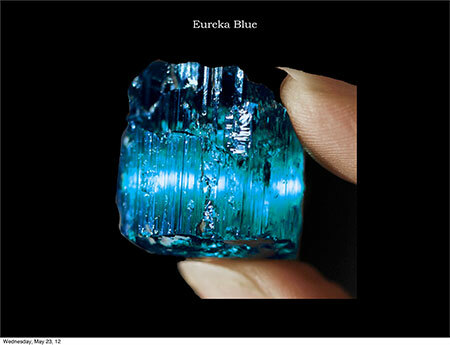 The article discusses the country’s major gemstones, highlighting recent production and new finds. New information is included on the gemological properties and chemical composition of ruby, sapphire, spinel, tourmaline, garnet and peridot from the major localities. Other stones also are reviewed. 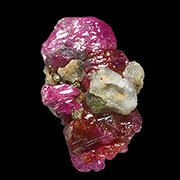 The luscious jumble of a ruby specimen pictured above is from Luc Yen, in northeastern Vietnam. It’s in the collection of Bill Larson. 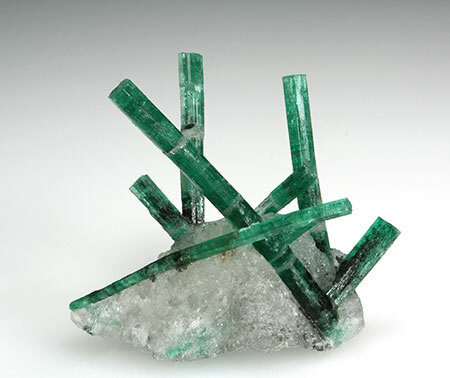 Luc Yen produces a host of gemstones and minerals, as listed in this Mindat entry. 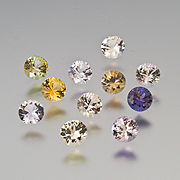 The three faceted gemstones, from Pala International, also hail from northern Vietnam. Left to right, they are a 1.97-carat blue spinel, a 5.07-carat red spinel, and a 2.27-carat ruby. Will Larson shares a remarkable memory regarding acquisition of the specimen. When I was 12 years old my father took me on a Southeast Asia tour visiting Burma, Thailand and Vietnam. Vietnam was our last stop and was an amazing experience. I remember flying into Hanoi, and my father pointed out the Russian-made planes, which looked rusty and old. He said we will not fly on those because of safety issues, and sure enough a few days later one crashed trying to land at Siem Reap Airport in Cambodia. After clearing customs we arrived at the house of my father’s contact, Sun Ta. The architecture is different, as they are very narrow but tall, three-story homes. What I probably remember most was that Sun Ta had a side business making T-shirts, like the ones you see at the store for fifteen dollars with cheap print on them. It was cool, I thought, to make your own T-shirt and being at the age of 12 I was fascinated with how it all worked. I played around and I was allowed to stamp my own shirt that I still have to this day (although a little small). We checked into our hotel and then got some shut-eye because we had to leave late that night to make it to the Luc Yen Women’s Market by 5:30 a.m. when it opened. The trip was about 225 km on many dirt roads, today an estimated 3 hours and 32 minutes on Google Maps, but on our trip took us closer to 7 hours. The trip was bumpy and I was so sleepy it was painful. The guy in the back of the Mitsubishi Pajero was riding in the trunk clutching an AK-47; I’m sure it was even more uncomfortable for him. I couldn’t wake up for the Women’s Market, as I had passed out in the back seat of the car, but at 6:30 the Men’s Market opened and my dad came back just before to wake me up and show me what he had purchased at the Women’s Market. I was able to purchase a few things: small spinels and tourmalines including an aquamarine crystal I still own. As we walked around the village the people of this area had not seen a Caucasian child before and found me very curious. At one point in the mid-afternoon I had about 300 people following me just to get a closer look and of course they loved to touch my hair, as it was good luck. I was also asked when I would marry by many of the young girls who seemed to be around my age and already had a two-year-old child. Farming villages are very different in Vietnam than here; it was quite a culture shock back then. I started thinking about what I should do for marriage and when I should have children. Ha! I was a cute and confused twelve-year-old. We stayed for just part of the day, as we had an appointment with the doctor on the return back to Hanoi that evening. Our trip back was full of adventure. The first thing we saw was a small open-pit in the middle of a rice paddy field. They were in fact digging for gems and allowed my father and me to see what they were doing. I found a few small bits of ruby in the stream that they let me keep. The farmers who were digging brought us a few pieces they had found earlier that had promoted the digging. It was unfortunately nothing too exciting, but there was a cute little spinel. Regrettably due to some circumstances they were unable to sell us the piece, so we moved on to continue our journey. 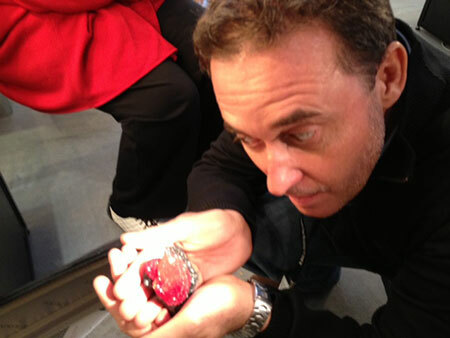 We stopped off to visit a doctor that, rumor had it, owned a few great ruby crystals from Luc Yen. We were greeted warmly and treated to some very good hot tea. The doctor then brought out his collection of ruby and it was amazing because we had never seen this kind of quality before. Out of everything we saw in the Women’s and Men’s markets, his collection was far better. The problem was he was not really interested in selling any of the pieces from his collection piece by piece, as he loved them all. Ruby is very good luck in Vietnamese culture. He did tell us that if he was able to get enough for these then he could perhaps purchase the condo he wanted, and this was in 1997 so condo prices were about the value of his rubies. So he said he would maybe work it out. We of course wanted to buy it all but didn’t have enough money on us. As we negotiated and negotiated we were forced to call my mother at midnight in the U.S. so that we could do a money transfer. Unfortunately we found out there was really no way of transferring the money to Vietnam without using a Visa card that had heavy fees associated with it, but it would be done quickly. Luckily the doctor was able to negotiate a better price on the condominium and this allowed him to reduce the price of his collection so we could then finalize the deal. 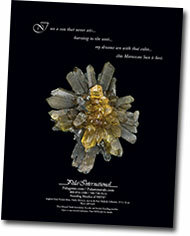 One of the crystals from that deal is on the cover of Gems & Gemology. 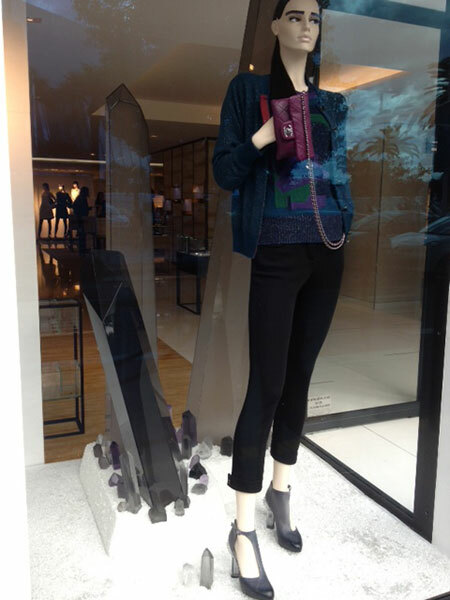 From Cannes to Munich to La Jolla, mineral crystals are gracing the display windows and cases of Chanel and J. Crew, courtesy Brice Gobin and Larsons Jeanne, Bill, and Will. Brice Gobin spotted this display in Cannes last month, on the Promenade de la Croisette. 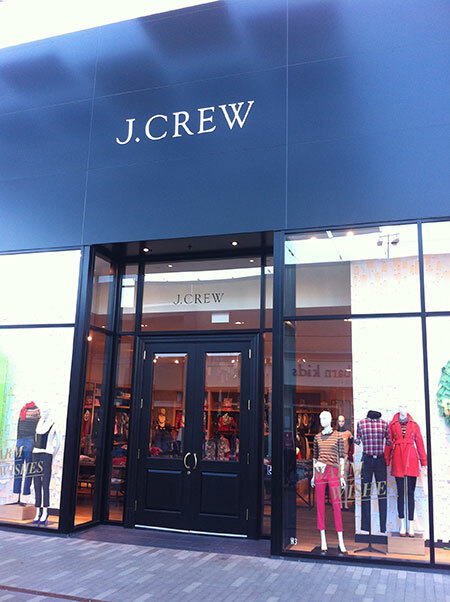 The mannequin even has amethyst eyebrows, he told us. 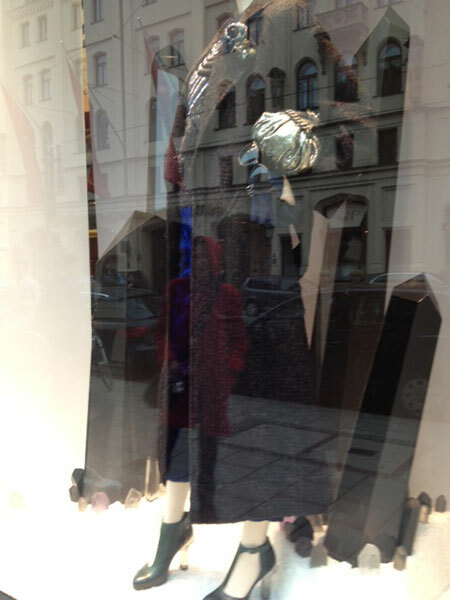 Jeanne Larson noticed a similar display, in Munich. 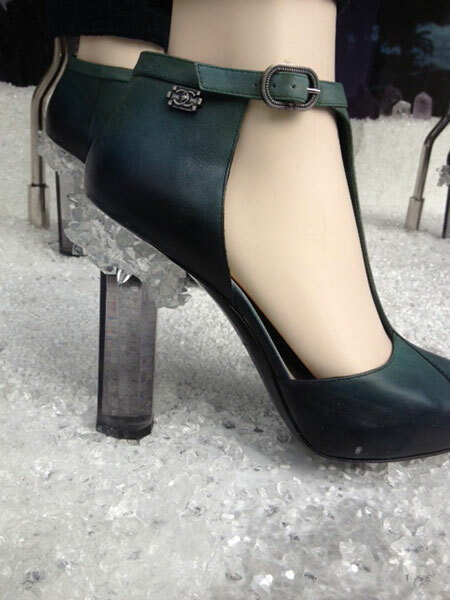 She told us that the quartz matrix and gray beryl of the heels actually are rendered in plastic. We liked the contrast of the (also plastic) oversized crystal terminations and the reflected windows and doors. Bill Larson spotted this image in the Bangkok airport. 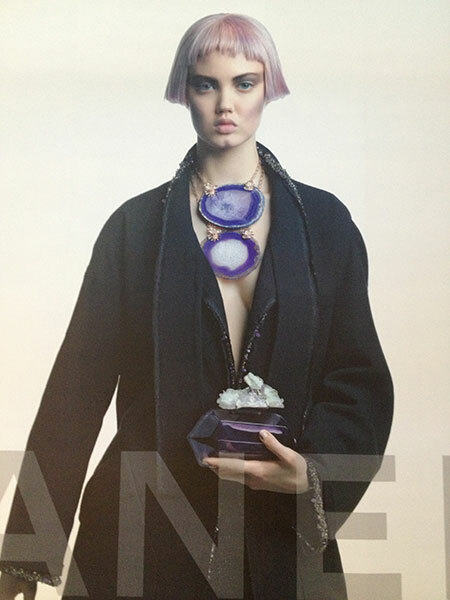 The ad’s model features slabs of Brazilian agate. 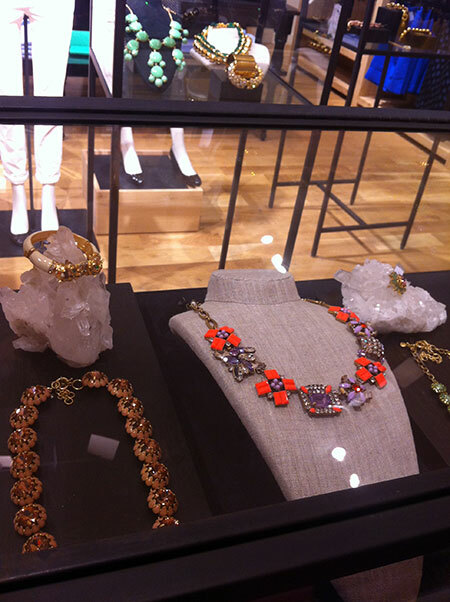 …display cases of jewelry perched on quartz crystals. Members of the San Diego Mineral & Gem Society are lucky: they receive an electronic subscription to The Pegmatite, the nicely produced bulletin of the Society. This month features “Gems from the Red Land,” an article by James A. Harrell, Professor Emeritus of Geology at the University of Toledo in Toledo, Ohio. The article is informed by 23 years and 33 visits to mines and quarries in Egypt, and beyond. The “Red Land” of the title, or Desheret, refers to the barren deserts that flank the rich Nile Valley and Delta. Lifeless, perhaps, but this is where Egyptians found lively carnelian and the meteoric Libyan Desert Glass as well as peridot, emerald, amazonite, amethyst, and turquoise, all of which are discussed and illustrated in the article. This eight-page piece—focusing on some of the 31 varieties of material employed in Egyptian jewelry (and their mines)—should whet the appetite for Dr. Harrell’s in-progress book, Ancient Egyptian Rocks and Minerals: Varieties, Sources, Uses and Technologies. 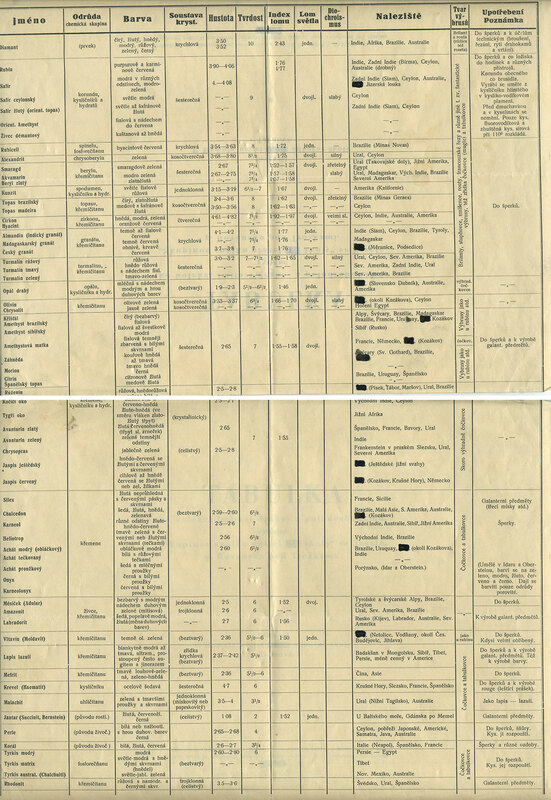 Although he has surveyed about 200 mines and quarries, in “Gems from the Red Land” Dr. Harrell drops tempting hints at the possibility of overlooked deposits of Dynastic (i.e., Pharaonic) varieties. 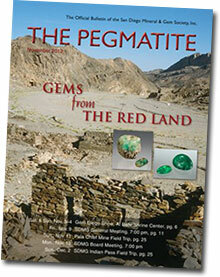 The Pegmatite is available to non-Society members in a reasonably-priced digital edition (as well as print edition). 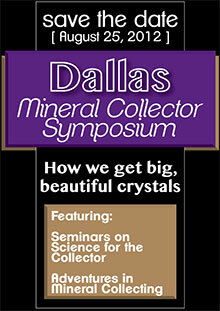 Details are on the San Diego Mineral & Gem Society website. In this edition of Pala Mineralis we call your attention to a recent robbery of the California State Mining and Mineral Museum in Mariposa. Please be on the alert for attempted sales of unusual specimens. Read more below. 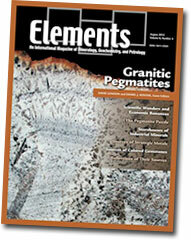 The August edition of Elements is devoted to granitic pegmatites. See the table of contents here. 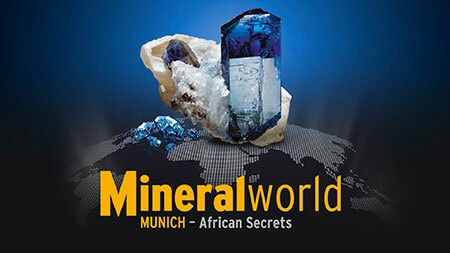 Pala International will be offering fine mineral specimens at this year’s Munich Show. This year’s special exhibit is titled “African Secrets,” which will feature more than 300 pieces from private collections as well as those of museums in London, Paris, Milan, Johannesburg, Brussels, Los Angeles and Luxembourg. Localities and minerals represented will be vanadinites from Mibladen in Morocco, malachites and wulfenites from Congo, tanzanites from Tanzania, and tourmalines, aquamarines, fluorites and more from Erongo and Tsumeb in Namibia. De Beers will exhibit one of its largest octahedron diamonds at the show. This exhibit will be covered in the debut of the Theme Book, a high-quality hardcover, which will be published in addition to the show catalog. Both publications will be delivered from the show store beginning October 1. See our ad in this year’s program. The specimen is now in the collection of Ron Gladnick. 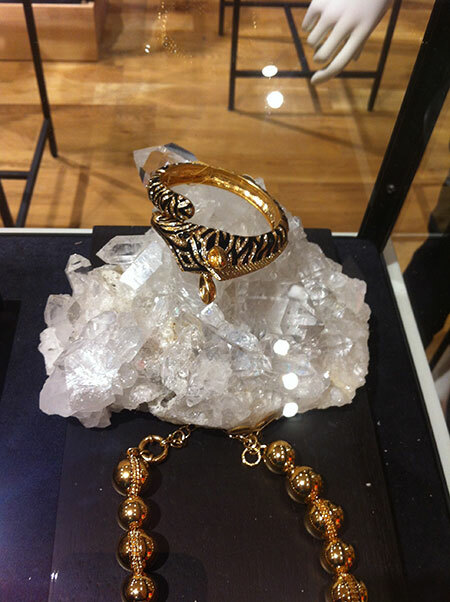 For more on the collection, see Pala Presents below. 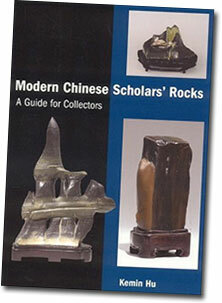 In Modern Chinese Scholars’ Rocks, author Kemin Hu shares her expertise as a dealer and collector. This past week, Southern California’s Bowers Museum featured special displays and lectures on bonsai and “viewing stones.” Bonsai, miniature living trees, will be familiar to many of our readers. But the contemplative appreciation of large-writ-small in bonsai also applies to stones. 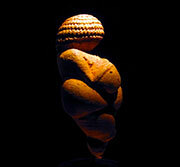 Viewing stones resemble landscapes, mountains, waterfalls, and more, as well as free-form sculptures, geometric designs, and anthropomorphic and bestial forms. Viewing stones can be large and weighty, suitable for a garden, for instance, or small enough for display on a desk. Viewing stones (and/or the art of their appreciation) are known by different names: “scholar’s rocks” or Gongshi (China), Suseok (Korea), Suiseki (Japan). Glossary entries from these three Asian cultures indicate the connoisseurship that has developed over centuries regarding the stones’ aesthetic and ruminatory qualities. The most prized of these stones have had little or no human help in achieving their display-state. Locality can be key to collectibility and in some cases, as with fine mineral specimens, sources may be played out. The smaller stones often are installed on a custom-made pedestal of carved wood or resin; they also can be placed in a shallow tray of sand. According to the Metropolitan Museum of Art, four aesthetic principles of the stones were codified by the Tang dynasty (618–907). For a quick view of the variety of viewing stones from Asia and elsewhere, see examples from the collection of the National Bonsai Foundation. For detailed descriptions of some of the many types of Chinese scholars’s rocks, visit this blog by collector, dealer and author Kemin Hu. 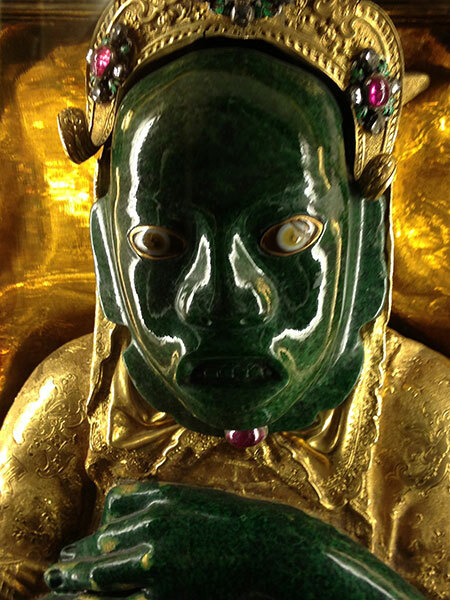 Jade has been fashioned in China since the Neolithic period, and jade objects from as early as 3500 B.C.E. have been found there in tombs. An ongoing exhibit at the Bowers, “Ancient Arts of China: A 5000 Year Legacy” features jade objects, such as a jade cong (a square-shaped cylinder) that dates from between the 31st and 22nd centuries B.C.E. This month we feature a beautiful single crystal of blue fluorite showcasing a nice purple phantom inside. 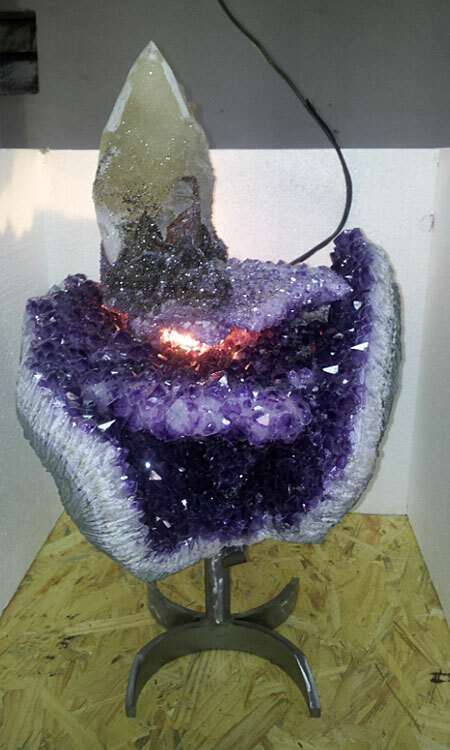 In the center of the piece, when lit from the bottom as seen below, the fluorite has a wonderful yellow-orange core. 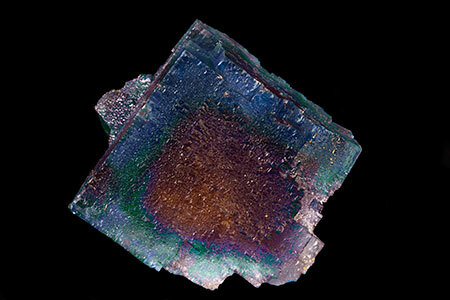 The complex surface of the fluorite has nice luster and the piece overall has little damage. 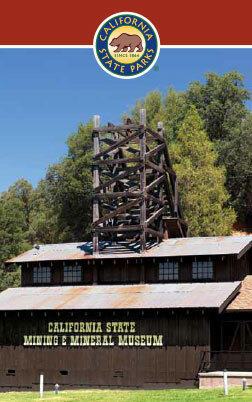 Last Friday afternoon, a robbery occurred at the California State Mining and Mineral Museum in Mariposa. 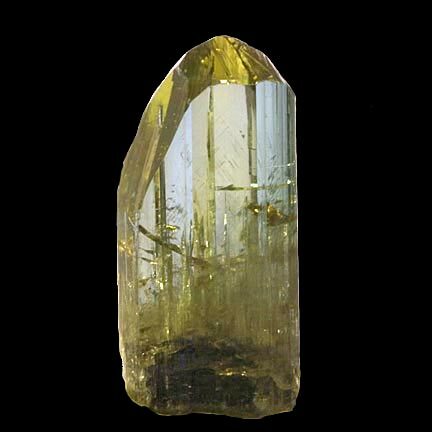 According to a State Parks press release, “a number of display cases, doors and other items were damaged by the approximately two suspects who entered the museum and stole an undetermined amount of precious minerals.” The parks agency was in the process of conducting an inventory of missing items, per the October 1 release. A Los Angeles Times story estimated the stolen loot to be worth as much as $2 million. That story claimed that the remaining valuables have been moved off site for the inventorying. Any leads regarding this robbery should be given to the California Highway Patrol – Central Division Investigative Services Unit at 559.277.7250. Two photo essays, both posted in early August, caught our eye recently, and we thought we’d share them. The Russian English-language entertainment blog, English Russia, posted a parcel of photos of abandoned mines. Pictured are mines for calcite, for the limestone used in the Kremlin’s original white stone walls and for muscovite. 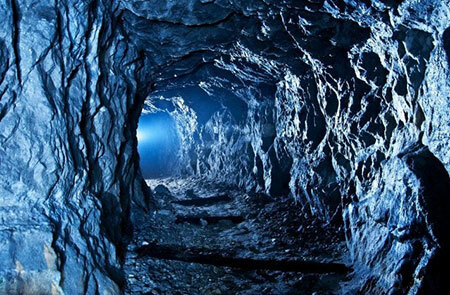 See “Destiny of Abandoned Mines” (and ignore the dopey ads…). Calcite mine from the English Russia website. 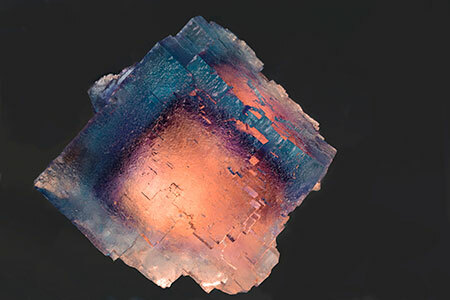 With Pala Presents, we offer selections from the library of Pala International’s Bill Larson, who will share with us some of the wealth of information in the realm of minerals and mineralogy. The present article happens to be from the pen of Pala’s Will Larson. 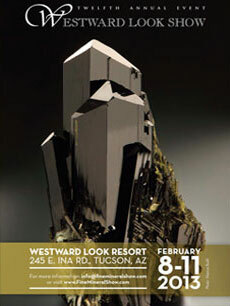 During this year’s Westward Look Show in Tucson, the mineral collection featured on Collector’s Day was that of Ron Gladnick. In this year’s third edition of Mineralogical Almanac, Will Larson takes us through the metamorphosis of Gladnick’s collecting focus, which didn’t begin with fine mineral specimens. 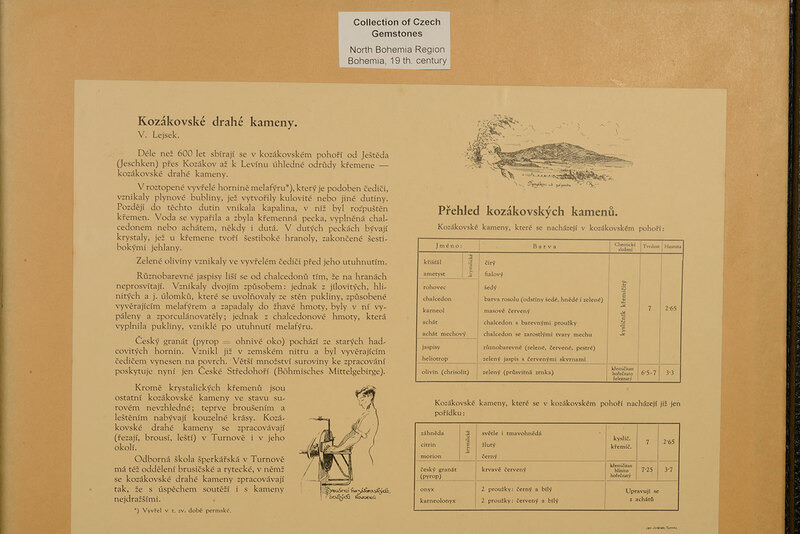 We are pleased to reprint the article, “Exhibition of Ron Gladnick Collection” in our Pala Presents series. With this edition of Pala Mineralis we conclude the four-part series published by Peter Bancroft in 1996 regarding San Diego County’s Sickler family. This installment follows Fred Sickler (who would become Fred Sr.) and his new wife Florence Awilda Orcutt far from the tourmaline mines of Southern California—to Shungnak in the U.S. territory of Alaska. Fred had obtained civil service employment, but this was no desk job; he was to teach Inuit people how to domesticate reindeer, used for food, rather than be at the mercy of unpredictable migration patterns. During his decade in the area, Sickler’s photographs of the aurora borealis phenomenon were said to have been the first ever published. Florence Sickler, meanwhile, became a teacher, nurse and midwife to the native people. Upon their return to Southern California, the Sicklers first moved to Los Angeles before Fred secured a job as foreman at the Pala Chief Mine, with which he would have an on-again, off-again relationship. Read Part IV of “The Sickler Family: Historic San Diego County Gemstone Miners” by Peter Bancroft. Two recent items from our sibling publication, Palagems Reflective Index, will be of interest to mineralophiles. 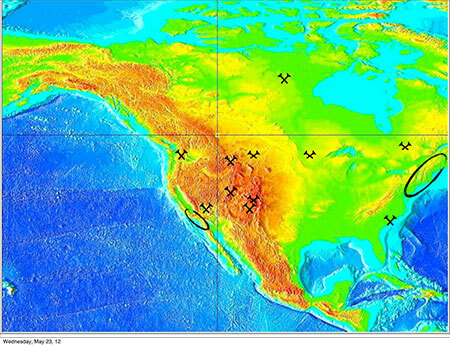 The University of Arizona has a thriving mineralogy program, and is host to the RRUFF Project, an integrated database of Raman spectra, X-ray diffraction and chemistry data for minerals. 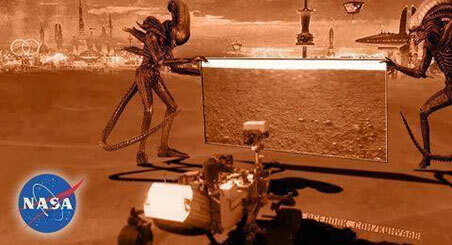 Two UA geoscientists also are involved in NASA’s Curiosity rover. Prof. Bob Downs and graduate student Shaunna Morrison are “primary data downlink leaders,” members of a team charged with IDing the minerals that come Curiosity’s way on its two-year journey on Mars. Read all about the high technology behind the project here. The Weardale Giant is the name given to a huge fluorite specimen uncovered recently in the Weardale mining district of northern England. It is also the name given to the legendary giants of the area, the blacksmiths Mug, Con and Ben, who could afford but one hammer between them. As they forged swords, they tossed the hammer back and forth, mindful of the curse upon them: if the hammer were to be dropped, they would vanish. It was Mug whose eyesight faltered along with his grasp; the hammer left a deep rift, now known as the Howden Valley. But back to the specimen. The “Giant” was so big—likely half a ton—it took from July 10 to August 13 in order to pry it loose and move it down ramps to the mine’s transport. 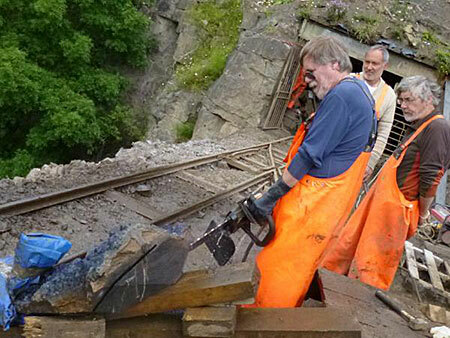 Then its matrix was sawed to make it more manageable, and down the mountainside for shipment to California. 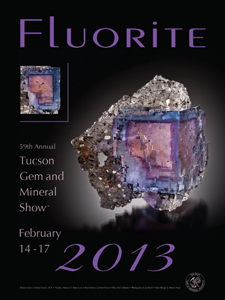 With any luck it will be displayed at the Tucson Gem and Mineral Show, in perfect harmony with the 2013 theme, fluorite. Seating is limited, so see the symposium website for details. Last year’s symposium featured luminaries from seven institutions from across the country. It’s available from BlueCap Productions. Just enter the code palaintl when you’re asked for it while ordering. What’s Hot In Tucson 2012 and What’s Hot In Munich 2011 also are available. Click images below for more info. Where: Ramada Plaza Hotel (formerly Holiday Inn Denver–Central), 4849 Bannock St. Note: Beginning with the third slide, click the boxed “i” to view captions. In April, Pala International’s Bill Larson delivered a keynote address to The Arusha International Gem, Jewelry and Minerals Fair, held in Arusha, Tanzania. 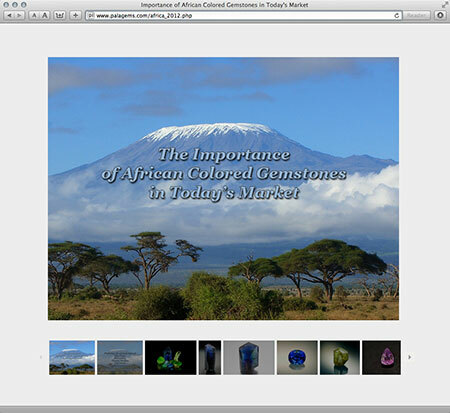 The subject was “The Importance of African Colored Gemstones in Today’s Market.” We’ve turned Bill’s PowerPoint presentation into an online slide show for your viewing pleasure. 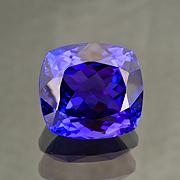 While in Tanzania for the Arusha show, Will Larson toured the local tanzanite mines, video camera in hand. 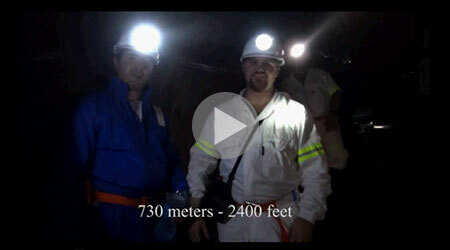 He visited the TanzaniteOne mine in “Block C,” as shown below, with Shawn George, left, as well as two mines in “Block D.” The resulting video, First Voyage to Tanzania – Tanzanite – A Stone of Beauty, inaugurates Pala International’s YouTube channel, available here. 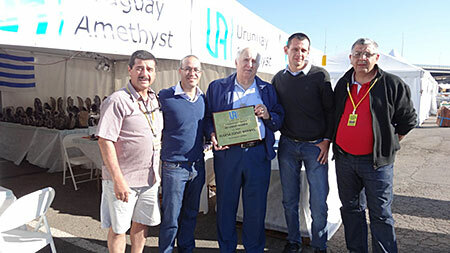 See also Will Larson’s written report on the Arusha show and visits to the mines, on Palagems.com. Scientists at the University of Arizona have identified two new minerals from the Wessels Mine, Kalahari Manganese Field, in north central South Africa. The material was produced in 2011, while miners searched for the well-known gem sugilite from this locality. The first of the new minerals is scottyite, named in honor of Michael M. “Scotty” Scott, the first CEO of Apple Computer and gem collector extraordinaire. Scottyite forms millimetric masses of cobalt-blue color without cleavage. It has the chemical formula BaCu2Si2O7, and orthorhombic symmetry. The synthetic equivalent of scottyite has unusual magnetic properties, which makes it interesting to semiconductor researchers. (Before Apple, Scott was director of manufacturing at National Semiconductor.) More information and photographs are available at RRUFF. 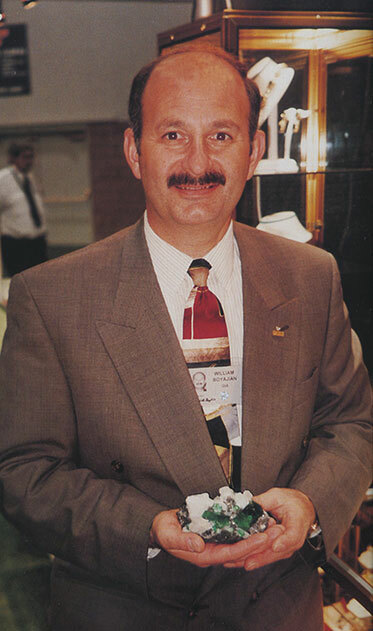 See also our 2005 profile of Scott’s collection at Palagems.com. Scottyite is associated with the second new mineral, lavinskyite, a lithium copper silicate related to plancheite. The name honors Dr. Robert M. “Rob” Lavinsky, proprietor of the mineral superstore The Arkenstone. 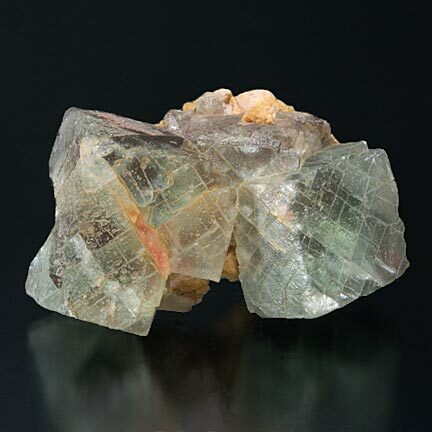 Lavinskyite forms blue, bright acicular crystals, in association with scottyite, richterite, and pectolite. More information and photographs are available at RRUFF. 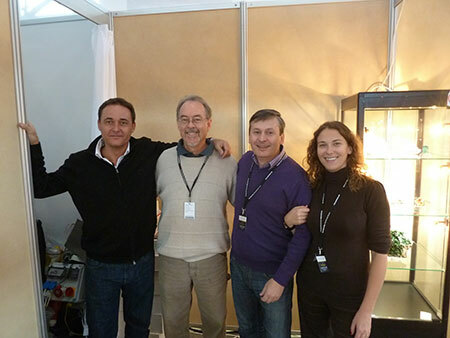 The International Mineralogical Association just approved the new mineral appellations in June 2012. Congratulations! 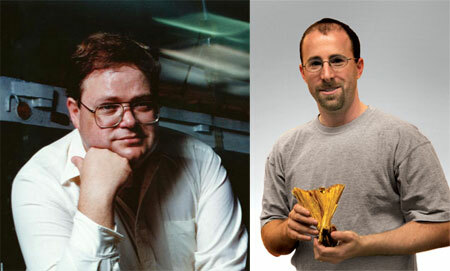 Michael Scott, left, and Rob Lavinsky, recently had new minerals named in their honor. 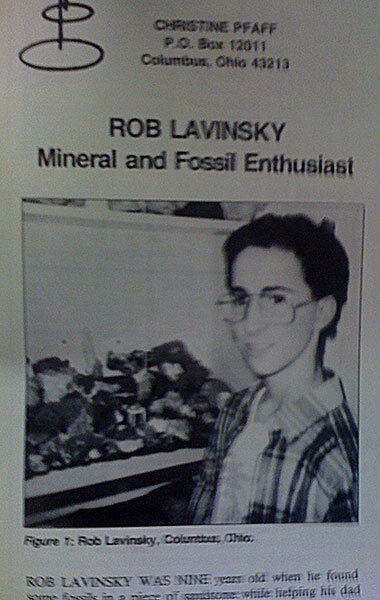 A young Rob Lavinsky pictured in Christine Pfaff’s “Spotlight on Juniors” column, Rocks & Minerals, Jan–Feb 1990. RRUFF is an integrated database of experimental mineral information, including X-ray diffraction, electron microprobe, Raman and IR spectroscopy of minerals. More information here. This is not the title of an outtake by Irish badboy-rockers Fatima Mansions. 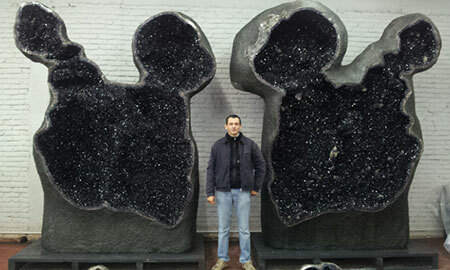 No, Mouseketeers, we’re referring to a plus-sized geodic amethyst from Artigas, a department in northern Uruguay. 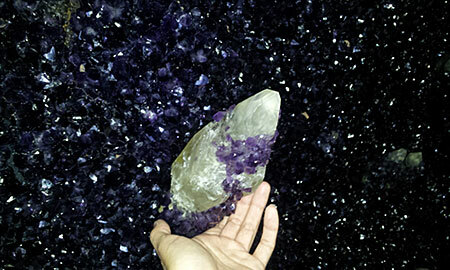 The photos of the Mickey-esque mammoth were sent to us by Sergio Aramburu, of StonesAgateAmethyst.com, purveyors of amethysts and agates from the region. 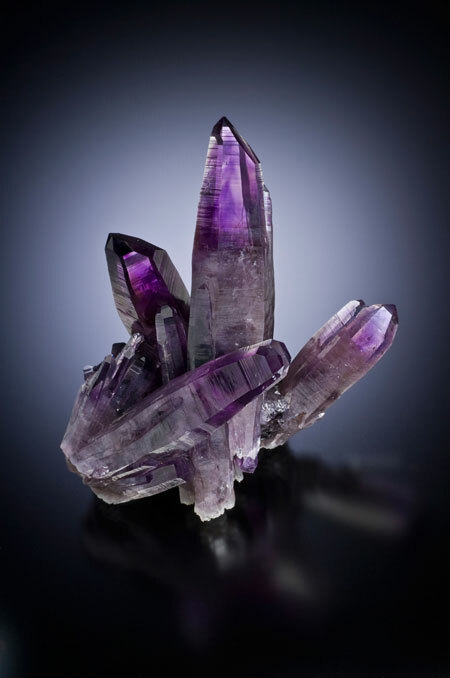 According to the website, the amethysts in this region were formed 130 million years ago. 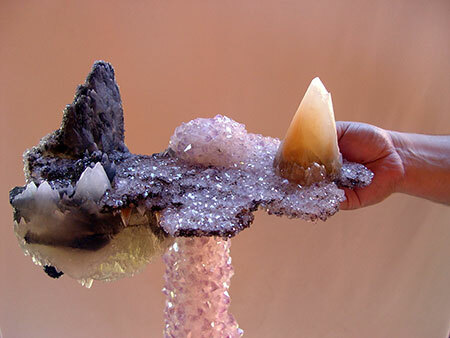 These formations were caused by gas-created cavities in lava, the walls of which gradually became encrusted with the violet variety of quartz silica via entry of a water solution. 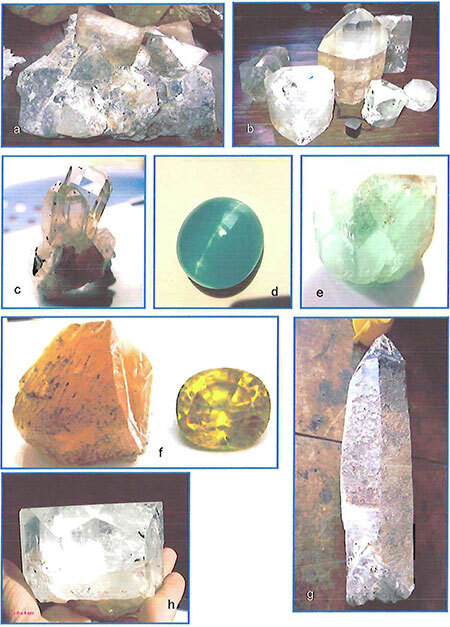 In this installment, we present Chapters VII and VIII of Kyaw Thu’s 2007 PhD dissertation, which survey the petrogenesis and geochronology of the Mogok Stone Tract’s igneous rocks. 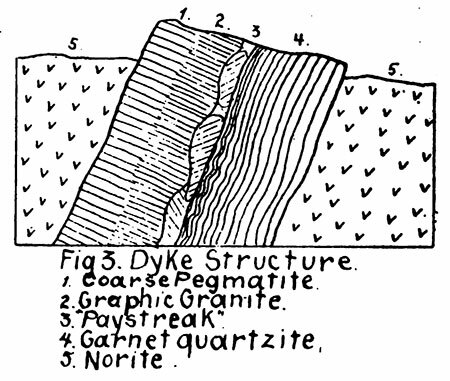 Five major sections are devoted to economic geology. The summary and conclusions are covered in seven sections. The Appendices consist of spectrographic images. If you’ve already read our other offerings regarding the turn-of-the-century tourmaline craze, don’t pass up the third installment in Peter Bancroft’s profile of San Diego County’s Sickler family. It provides a look at the role played by Southern California Chinese immigrants in that chapter of the region’s gemstone trade. Along the way, you’ll read of tourmaline-as-lotto-prize, knifings in the mines, a gunshot to the leg (via the Agua Tibia Ranch—we’re not kidding), orphan miners, the demise of the Sickler flour mill and more. 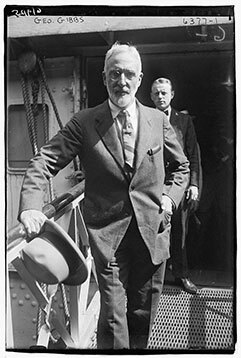 Part III concludes with the wanderings, both stateside and abroad, of kunzite discoverer Fred M. Sickler, Sr., who eventually became fluent in a septet of tongues as he studied mineralogy in Heidelberg, practiced journalism in Panama, and got mixed up in the Boer War, amongst other escapades. Three recent items from our sibling publication, Palagems Reflective Index, will be of interest to mineralophiles. In late June, Dr. Rajnikant Shah unveiled a virtual museum devoted to postage stamps of gemstones, minerals, jewelry, clocks, coins, and gold and silver. 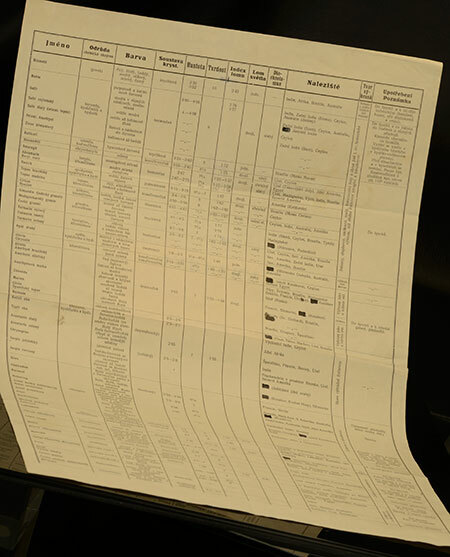 The museum database has over 10,000 items. Visitors can easily filter down to an area of particular interest. A search function also is available. According to the website, Dr. Shah began collecting at school in Jaipur, India, in the year of the country’s independence, 1947. 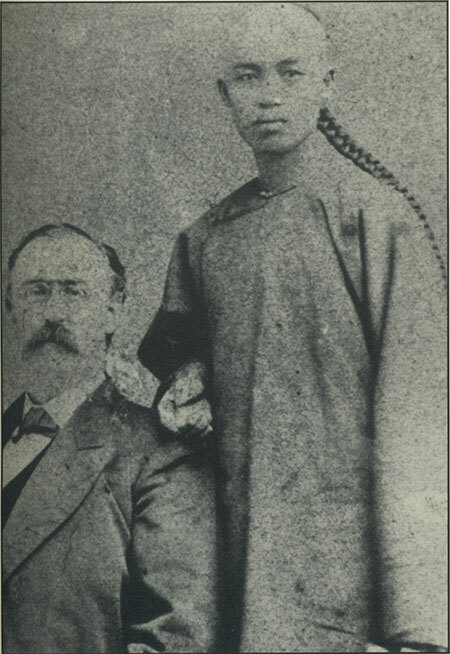 The first stamps came from his parents, who lived in Burma. Thirty years later, he found himself in the United States in his family’s profession: gemstones. 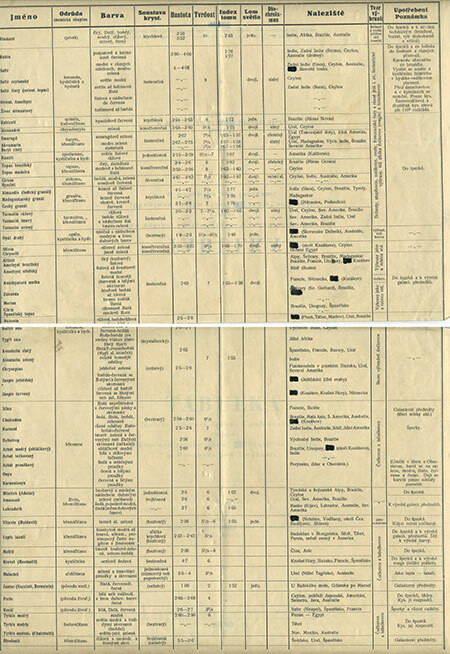 The travel that the business required gave him access to stamps from a variety of countries. 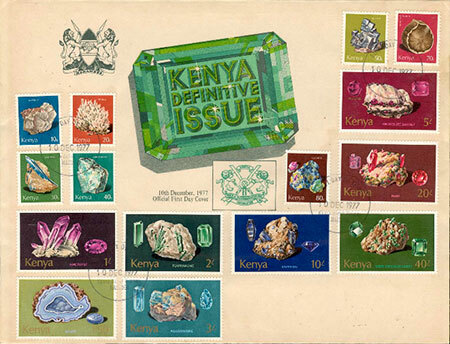 In his choice of philatelic themes, he brought together his hobby with his profession. 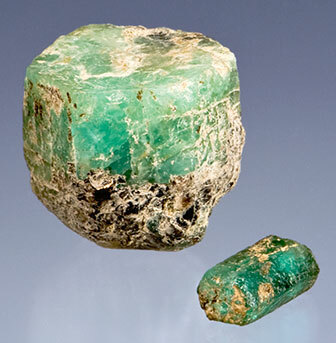 Two views of the Yamile emerald mineral specimen. Above, photographed by Rodrigo Moncada from his Colombian Jewelry – History & Art. 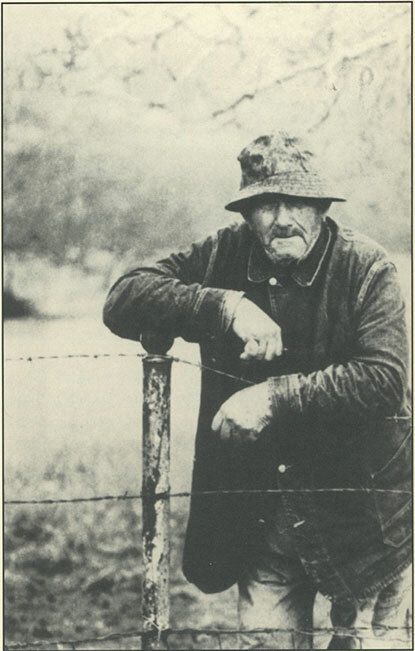 Below, photographed by Harold and Erica Van pelt, from Thompson’s Ikons. Pala’s involvement began with Bill Larson being shown the piece in Munich in the late 1990s. The price at that time was in the multi-millions of dollars. 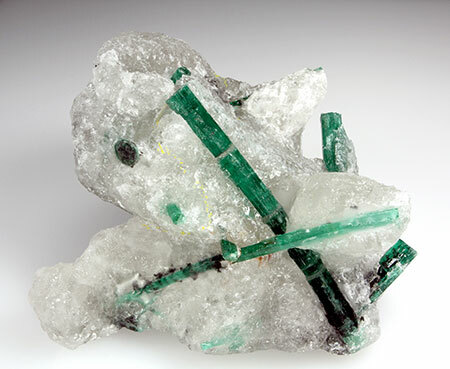 The interesting part for Larson was not only the two large, superb colored emerald crystals typical of Muzo, but also that the mineral specimen had been carefully removed from a pocket so that it retained perfect, large, beautiful twinned calcite crystals. Pala followed the specimen until it resurfaced a few years later, at a considerably reduced price. 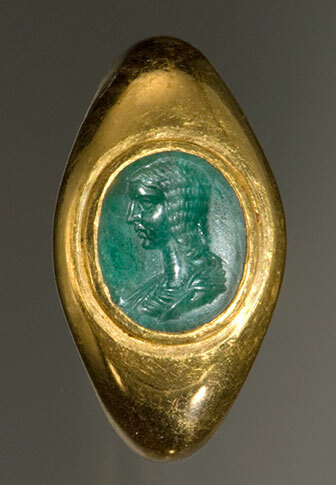 This time the piece was in possession of an emerald dealer who had supplied cut emeralds to Pala for years. Larson suggested a unique situation: an offer of purchasing half and leaving Carranza with 50% ownership. This deal was approved and Larson called upon his long-time friend Wayne Thompson to purchase 25%. This he did. 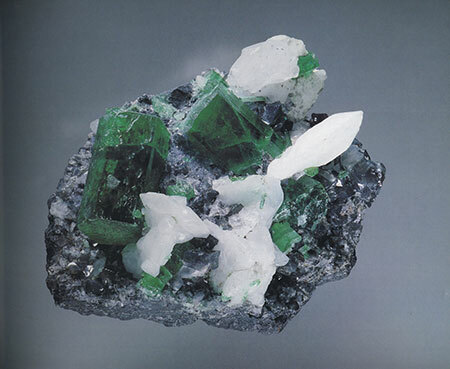 The emerald would later be featured on page 157 in Thompson’s now-famous book Ikons: Classics and Contemporary Masterpieces of Mineralogy. Brian Cook of Nature’s Geometry takes us on a tour of three famous mining regions accompanied by some photos from geography to geology, from specimens to gems and jewelry. Starting here in the U.S., Cook presents the two great tourmaline mining areas at the furthest extremities of the country, from the blue and green tourmaline of Maine to the pink tourmaline of Southern California. Then, heading south, we go to Brazil for the wild array of tourmalines, finishing with an in-depth look at the most rare and famous tourmaline variety of all… paraiba. Access the PDF of the presentation here (13.4 MB).